In order to appreciate and be inspired by the misunderstood Mexico City, you have to go beyond the idea of simply seeing it. You have to live it. You have to open yourself up to the everyday Mexico City, roll around in it, absorb it. And eventually it will reveal the tremendous heart that both overtly and subtly is a part of the city’s daily life. Mexico City’s lively markets are great places to start. Before saying a temporary goodbye to Mexico City and boarding a night bus to Chiapas, I visited three of the city’s most notable markets. It was a tour led by Alejandro, the exceptional guide who introduced me and a few fellow hostelers to the stories behind La Virgen de Guadalupe and the Plaza de las Tres Culturas on a previous day tour. We took a small rickety local bus to get to our first stop, the Mercado de Sonora, a center of commerce for alternative medicine and religion. While people tend to focus on the witchcraft aspect of this market or the cult of Santa Muerte paraphernalia, what caught my eye there were the stalls with burlap sacks full of centuries-old herbal remedies to help people sort out a variety of ailments. Alejandro mentioned that a lot of the vendors in the Mercado de Sonora weren’t too keen on tourists poking around with their cameras, so I waited until we were in the more lighthearted sections of the market before taking pictures. Pictured above is a market stall full of all things Lucha Libre. Piñatas for sale at the Mercado de Sonora. It was a short walk across a bridge over a road to our next stop, the gigantic Mercado de la Merced. The highlight of La Merced Market was the food. 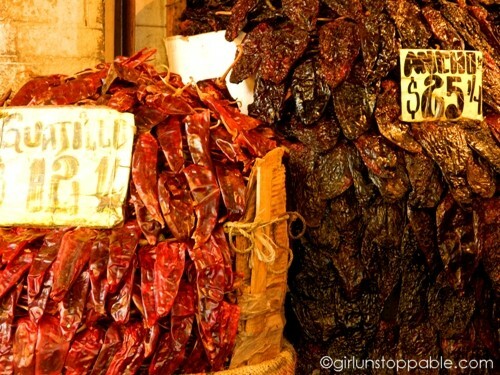 Pictured above are dried chili peppers. 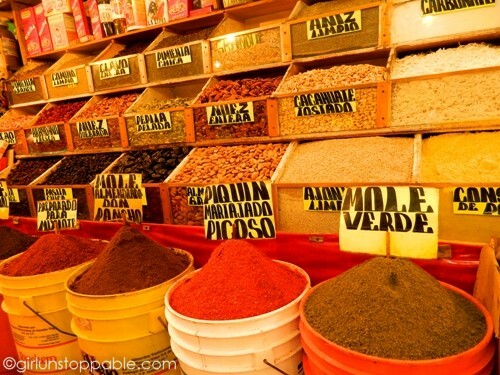 Spices and nuts for sale at the Mercado de la Merced. 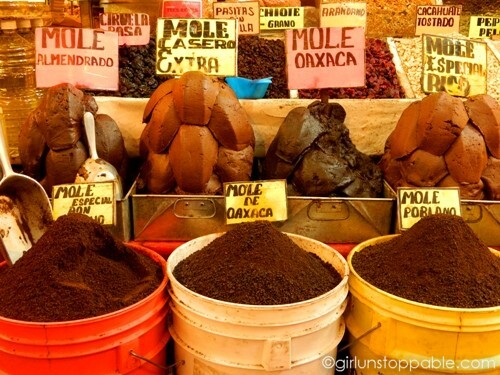 Seeing various moles in different forms made me even more excited for my eventual return to Oaxaca. Mole is not much to look at, but once you’ve had a good one, there’s no going back. As a U.S. resident, it’s both uncomfortable and liberating to visit places where goods are not all tightly wrapped in plastic. Buckets of candy at the Mercado de la Merced. Pinatas for sale at the Mercado de la Merced that were conveniently located next to some of the candy stalls. We hopped on the metro to get to our last stop, Mercado San Juan. Alejandro prefaced our entrance into this meat market with a discussion on how people in Mexico tend to have a closer relationship with their food. It was his way of warning the potentially squeamish about what we were about to see as well as encouraging people be open to different ways of looking at food. Lovely photos. 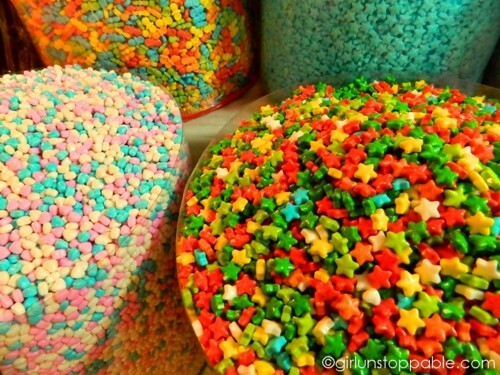 My favourite are the candies and the nuts ones. “As a U.S. resident, it’s both uncomfortable and liberating to visit places where goods are not all tightly wrapped in plastic” I’m curious to know what makes you uncomfortable and why. Thanks, Ana. It’s uncomfortable because I grew up in a country with really different ideas about “sanitary” ways to present food for sale. With the exception of produce (and not always that, even), in the US, you get used to seeing food either packaged or behind glass (like meat sections in the supermarket). 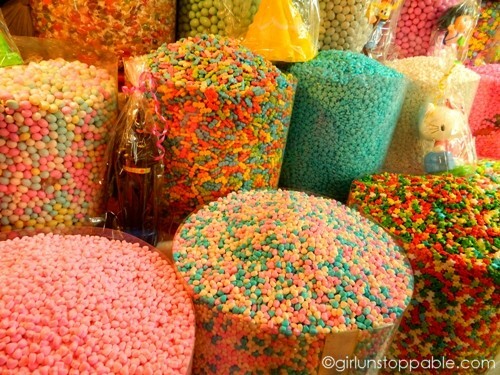 Even if you want to buy candy in bulk, it will at least have a lid on it. When you grow up seeing that kind of thing regularly, it can be unnerving at first to see the way most of the rest of the world is not so uptight! The DF is totally misunderstood! I’m so happy that you’re trying to change that with your blog. Changing people’s minds about Mexico City is not something I’m intentionally trying to do, I just want to honestly present what I saw and enjoyed about it… which has nothing to do with the commonly presented image of the city! But if I do change some minds about Mexico City in the process of blogging about it, that would be awesome. You should go! People will always question you if you want to go to Mexico City and they’ll continue to question you if you end up liking it, haha. If you go and need recommendations, feel free to ask! My name is Victor. I am originally from Mexico City. Eleven years ago I moved to Sydney and have had the chance to go back home about 5 times, the most recent one being June-uly this year. Being away has made me look at my city with different eyes. Not that I did not appreciated it before, but as a local I suppose I was it. Every time I go back I can sense the vibrancy of Mexico city at all levels. 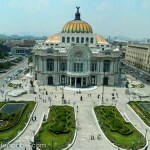 Without trying to be biased I really think Mexico city is so misunderstood. It might look a bit rough on the outside but once you go under its skin it will make you fall in love with its human side and people would like to go back. Thanks for your and everybody’s interest in my city. My casa es tu casa. Thanks for stopping by, Victor. Mexico City definitely has its fair share of problems, but it also has a unique vivacity about it that I think a lot of people don’t see. Thanks for sharing your photos. Reminds me of how much I have yet to see in Mexico City! Oh I totally agree, you really have to live Mexico City and what a place for it! I’m sorry that they discourage photos of the herbal remedies, I wanted to see if I recognized any. 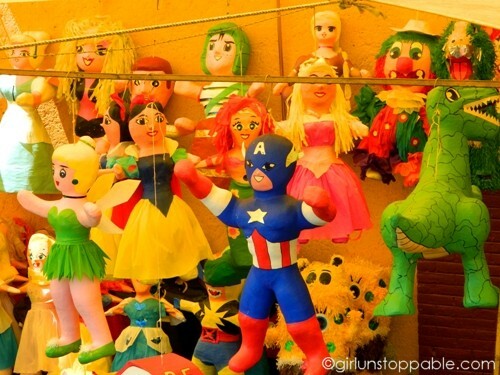 I was also struck by how many of the female pinatas were blonde. That’s not something I remember seeing a whole lot of when I was last there. Yeah, it was cool to see the herbal remedies. Really wanted to take pictures, but at the same time I guess it’s good to put down the camera from time to time. They were in sacks and they were labeled with what they could be used for – digestive issues, diabetes, etc. 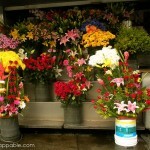 The people who sell them can tell a person how to prepare the herbs so that they are effective. I guess they might be slower than modern medicine, but are proven to be effective over time. I definitely did notice and was surprised by the abundance of non-Mexican themed pinatas overall. So many of the blonde ones were Disney themed and a few were just randomly blonde… unlike the majority of the population. This is something that frustrates me about Mexico in general (and of course many other countries around the world) – there is so much great culture to work with that’s from the country, but it often gets tossed aside in favor of Westernized things. 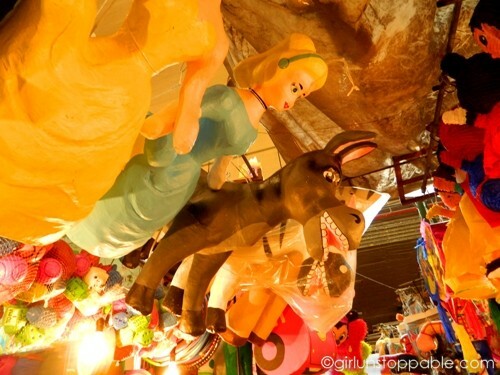 It is true about the abundance of abundance of non-Mexican themed pinatas overall re: blonde piñatas. There’s a social/historical thing there (a bit long to expand in a comment here). It is true that not the majority of the population is blonde, quite the contrary; the other side of the coin is that Mexican population is very diverse in spite of not being an imigration base place like other countries. Both looks, psyque and habits change from one region to another (i.e Yucatan, Chiapas, Oaxaca to Mexico City, Queretaro and Puebla to Jalisco, Nayarit and so forth). Markets in Mexico city (and probably in most of the country) are definetely a window to the diverse world that Mexico city is. It could surprise you, shock you or confirm what you knew. Thanks everyone for your interest in my part of the world. If you feel like asking any questions, and if I could be of any help, feel free to drop a line. Victor, I’ve seen the same kind of thing around the world, particularly in the global south. It manifests itself in different ways… you might see it in toys, advertisements, what kind of people are likely to become TV stars, a prevalence of skin lightening creams, etc. It’s an unfortunate remnant of colonialism that’s fueled by globalization. As you said, markets are a great place to really get an honest view of a location and I felt like I did get that at the three markets we visited. The lack of Mexican culture in something very Mexican that is typically intended for kids was bothersome, but it was just a small part of what I saw that day. It was worth a visit and my time there was definitely enhanced by having a knowledgeable guide! 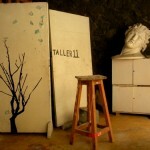 Lovely pics! Would love to visit Mexico some day. 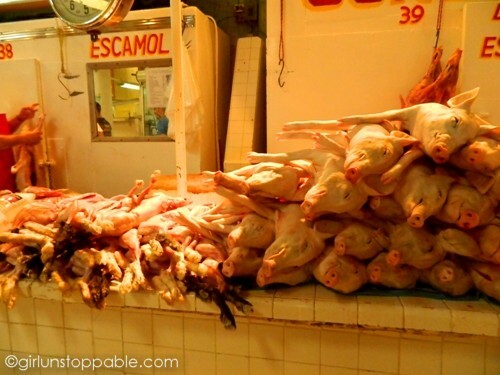 I’ve never seen a pile of young pigs like that in a market. Very interesting. 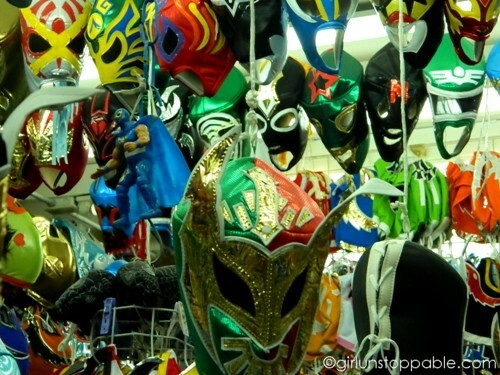 I loved that Captain America pinata.Did you get a chance to try on any of the lucha libre masks? You, the meat market was very different from the chopped and packaged stuff I’m used to seeing. Even when I’ve seen whole animals for sale in a lot of other countries, I’ve never seen anything quite like this market! I didn’t try on any Lucha Libre masks, I was wandering around with my camera 😉 But a few people on the tour tried some on and bought matching ones for the wrestling match they were going to go to later that night. What wonderful photos! I love foreign markets, the good ones, the fun ones, the smelly ones. I’ve shopped in the Makola Market in Ghana (you’ve been there I read), the souk in the Old City of Jerusalem, the Vernissage in Yerevan Armenia (fabulous flea market), the wonderful fruit and vegetable markets in Ecuador, and others. I love the color and the life and the ambiance in foreign markets, and visiting then is always one of the first things I do when in a new country. 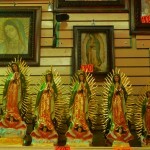 Great fun to see your photos of the Mexican markets. Yeah, my family is from Ghana so I’ve been there a few times… Makola Market is quite an experience! Markets are often an uncomfortable but important stop when getting to know a new city! 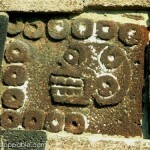 Since you’re new to my blog, you probably don’t know that I visited Mexico in the summer of 2010 as well. I had about 3 weeks last year and this summer I spent a month. I always feel like visiting Mexico! During these trips, I’ve gotten to see some of Mexico’s many unique sides (an idea that a lot of Americans refuse to comprehend) and continuing to discover them is something that continues to draw me to it.